The first component of an air conditioning system to consider is the gas. The gas used in air conditioners is called Freon. The Freon is put into a sealed system. The Freon is then pressurized using a compressor. As it is pressurized, it gets hot by absorbing the heat around it. The hot Freon is then circulated to the condenser. The condenser is a device mounted in front of the radiator and behind the grille; it looks a lot like a radiator. The condenser is used to change the high-pressure Freon vapor to a liquid. Air flowing through the condenser removes heat from the Freon changing it to a liquid state or now a refrigerant. The refrigerant then moves to a receiver drier or an accumulator depending on the type system you have. Moisture is removed from the refrigerant because moisture can freeze causing a blockage. The drier or accumulator are also storage tanks for the liquid refrigerant keeping it from moving out to the compressor and causing damage to it. The compressor is designed to compress gas not liquid. The liquid refrigerants pressure is lowered by an expansion valve for receiver drier systems or an orifice tube for accumulator systems and turns it into a refrigerant gas in the evaporator. As the cold low pressure refrigerant is released into the evaporator, it vaporizes and absorbs heat from the air in the passenger compartment. As the heat is absorbed, cool air will be available for the occupants. 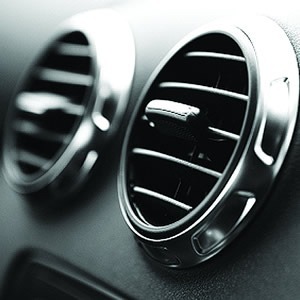 The same blower for the heating system blows air through the cold evaporator and distributes it through the air conditioning ducts in the vehicle. Program and use the proper recovery machines to ensure that none of the material escapes during service. By keeping your air conditioner properly maintained you will reduce repair costs for compressor and all other components. The Environmental Protection Agency determined that the refrigerant Freon also known as R-12 or CFC-12 was damaging the ozone layer and stopped production of the material. Now R-12 Freon is hard to find and very expensive. Although most vehicles produced before 1995 use R-12 in their air conditioning systems our Technicians can retrofit your vehicle to the new approved R134a. R134a is a more environmentally friendly refrigerant. This retrofit is more cost effective than attempting to repair the older systems. Retrofitting for cost and environmental savings can be done even if your older air conditioning system is functioning. However, a retrofit will not fix a broken air conditioning system.